I first met Matthew Fogg at the 2007 National Judicial Reform conference held in Houston. It was hosted by the National Judicial Conduct and Disability Law Project, which is a group that fights for legal reform in America. I served on their media team and helped to bring some of the 'Jena Six' families there to speak at the conference. I listened to Mr. Fogg and others speak on their years of fighting against the unfair dealings of the American court system as well as his personal bout with racism in law enforcement. I would later research more on Mr. Fogg and found out that he done some note-worthy feats. According to his biography "in 1998 he became a barrier breaker and trailblazer against racial discrimination in the federal workplace. 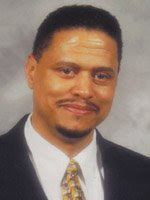 A DC federal jury awarded him a landmark four million dollar judgment that promoted him to Chief Deputy US Marshal and found the entire US Marshals Service to be a "racially hostile environment for all African-American Deputy US Marshals." His 23 year journey to justice has spelled bound audiences as he relates to dangerous and perilous times not only created by those he arrested but often by colleagues who wanted him silenced." Also "during the tragic 9/11, while near the World Trade Center in New York City, Mr. Fogg volunteered his expertise to render search, rescue and recovery to victims of the terrorist attacks. The image of him recovering the body of a deceased NY Firefighter was later featured in the October 2001 edition of Peoples Magazine. He was also interviewed by CNN's Paula Zhan who spotlighted his heroic efforts at Ground Zero." And on top of that he is currently working on a book, 'Bigots With Badges'; depicting his more than 20 year journey to justice within the US Department of Justice.